—Statewide moving services without interruption. You’ve found that perfect new home and you cannot wait to move in! Now you need an Ohio long distance moving company who can get you there so you can concentrate on transferring utilities, forwarding your mail service, and picking out the new drapes. Rely on RLD Relocation & Logistics of Akron Ohio to take the heavy load of moving off your back. We are happy to put it on ours. We are a Prime Agent for Arpin Van Lines offering uninterrupted weight-based transportation to all points in Ohio over 40 miles from our Akron offices. Many of our Ohio in-state moves can be completed within one week of booking your move with us. If your move requires full or partial packing services, we can provide that as an additional service. RLD will schedule a time with you to come out to your home and complete a visual survey of your household goods. We will notate any high-value items and discuss your belongings that require special care and handling. We then prepare a free written estimate for your consideration. The Ohio Long Distance Moving Company Providing Red Carpet Service! Once you decide to book your move with RLD, the trusted Ohio long distance moving company, we will assign one of our experienced van operators to personally greet you on moving day. Whether you have one room of furniture that requires a small truck, or an entire large home that requires a 53’ moving van, we will take a descriptive inventory of your belongings. 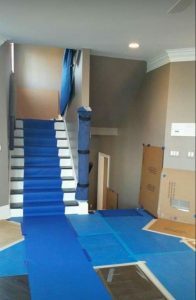 We ensure the moving crew protects your home with pads, rug runners, carpet floor protection, and door-jam covers prior to placing the first pad on your furniture and loading it on the truck. Before every job begins our moving crews protect your homes interior against any potential damages that may occur during your move. One we arrive at your new home, we will roll out the red carpet again. We carefully place all your belongings exactly where you want them. If your move includes unpacking services, we will haul away the used cartons at no added cost to you. RLD wants to make sure your first night in your new home is a stress-free one so you can concentrate on getting settled in. RLD Relocation & Logistics, your trusted Ohio long distance moving company — customer care and satisfaction are our top priority. We serve as Akron movers, Cuyahoga Falls movers, Hudson OH movers, Kent OH movers, Massillon movers, Medina movers, Perry OH movers, Stow OH movers, and Wadsworth movers as well as all other communities in the Northeast Ohio region and beyond.